Includes: 5m (16.4ft.) Lead set set comprising 2 x 50mm, 2 current leads with clips and 2 potential leads with clips, Download Manager, DLRO 600 User Guide on CD-ROM, RS232 download cable, Quick Start Guide (English), Quick Start Guide (French) and Warranty card. The Megger DLRO600 is an a.c. powered low resistance ohmmeter deigned to measure d.c. resistances in the low milliohms or microhms using a maximum test current of 600 Amps d.c. 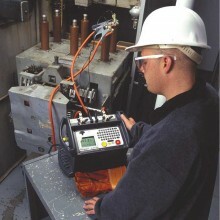 The maximum test current available is dependent upon the power supply, the resistance of the test leads and the resistance of the item being tested. 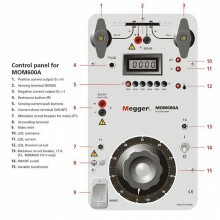 The unique design allows the weight and size of Megger DLRO600 to be kept to a minimum; the instrument weighs less than 15kg. This small size makes DLRO600 equally at home in the workshop, on the production floor or in the field. The high current capability and compact design make DLRO600 suitable for testing circuit breaker contacts, switch contacts, busbar joints or other applications where high current is needed. 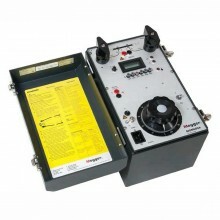 This versatile instrument can provide test currents from 10 amps up to 600 amps subject to the load resistance and supply voltage. 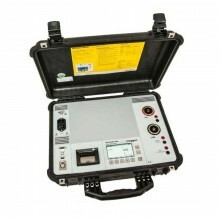 The DLRO 600's large liquid crystal display provides all the information needed to perform a test; all test parameters and measurement results are displayed. 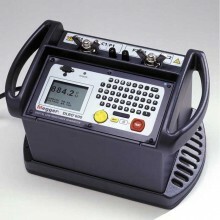 The DLRO600 uses a four terminal measurement technique to cancel the resistance of the test leads from the measurement. Small and weighs less than 33 lbs (15 kg). 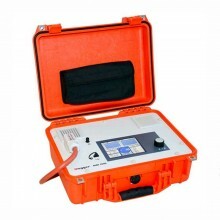 Test currents from 10 A to 600 A dc. On board memory for up to 300 test results and notes. RS232 port to download stored results or for real time output to a printer. 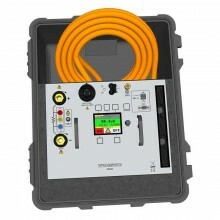 Supplied complete with 16.4 ft (5 m) test leads and download software. 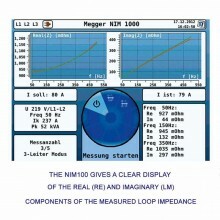 Range 0.1 μΩ to 999.9 mΩ (subject to supply voltage and leads used). Voltage Accuracy ±0.5% ± 0.1 mV. Current Accuracy ±0.5% ± 0.1 A. Resistance Accuracy Better than 1% from 100 μΩ to 100 mΩ. 2 x 15 m 95 mm² current leads: 6 mΩ. 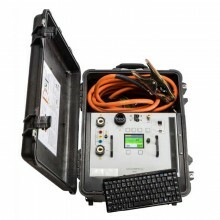 Maximum Continuous Test Time More than 60 seconds at 600 A @20°C ambient. Full Output 207 to 265 V 50/60 Hz with a load less than 7mΩ including current leads. Reduced Output Down to 100 V 50/60 Hz. Test Modes Manual, auto, continuous. Refresed every 2 seconds in CONTINUOUS mode. Display Large high resolution backlit liquid crystal display. Warnings Current flowing: - LED. Other warnings on LCD display. Data Transfer Real time or batch download via RS232 using download manager. Storage Capacity 300 result sets and memo, battery backed for 10 years. Memo Field 200 characters max. Range 10 to 600 A unsmoothed DC in 1A steps. 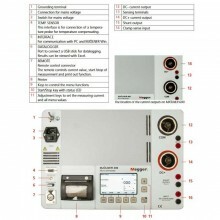 Accuracy ±2% ± 2 A.
Voltmeter Input Impedance >200 kΩ. Hum Rejection 5 V RMS 50 Hz/60 Hz. Max Humidity 95% RH non-condensing. Dimensions 410 x 250 x 270 mm. Weight 14.5 kg (excluding test leads). 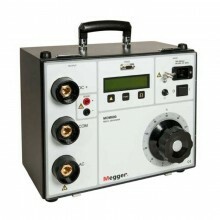 PDF Specifications of the Megger DLRO600 Digital Microhmmeter. 2 x 50 mm² current leads with clamps and 2 x potential leads with clips. 2 x 70mm² current leads with clamps and 2 x potential leads with clips.